I have always said that I made a lot of stupid mistakes in my life. And buying a 6 cylinder 1000 cc Honda CBX, you might think would be one of the stupidest. Back in 1986, my Honda Silver Wing at 500 cc was the biggest bike I had ever owned, and the fastest. I actually did not think I needed anything faster. But then one day while riding with a group of other riders on much more powerful (1100cc) bikes, I had an epiphany. I was following one of these superbikes that pulled out to pass a car. I decided to follow, as there was plenty of road even for my little 500 to do a passing maneouver. So following my normal procedure on the Silver Wing, I downshifted twice and cranked the throttle wide open. I was almost past the car, when suddenly I found myself about to ram the backside of the superbike I was following. I avoided an accident, but I was puzzled, to say the least. At the next gas stop I inquired as to what might have been the problem, as his bike was theoretically so much faster than mine. He answered that he was not indeed using full throttle on his bike, never had, and probably never would, due to fear and fear alone. Apparently a bike could be so powerful the rider would be afraid to open the throttle! Obviously, I had to have one. A few years later, while visiting a motorcycle shop in nearby New Hamburg, I spotted something even better than an 1100 cc superbike, it was a used 1981 CBX for sale. In the next few days I considered buying it, talked to my wife of the importance of owning this beast. Frankly, I do not remember how that conversation went, I can only assume I was dazzling in my eloquence. Or she just wanted to shut me up. She may also have been given the impression it was a practical bike, although I am sure she could count the exhaust pipes for herself. Two days later I was back and as I recall, purchased it for $2500. 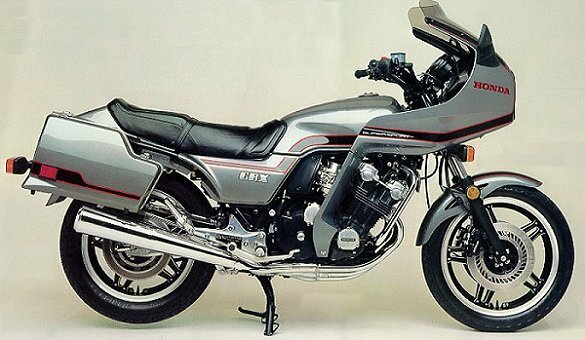 In it's 1981 introduction, the CBX was Honda's most expensive motorcycle. It was as excessive as my Silver Wing was modest. The CBX had six cylinders, six carburetors, 24 valves, 1052 cc. The previous owner had fitted it with a Wolf exhaust system, which made more noise than I wanted, but it would have cost me more than I could ever afford to buy a new Honda CBX exhaust system. I kept the Wolf exhaust which was quiet if you didn't rev the engine much and accelerated slowly. The Wolf exhaust had also messed up the carburetion – when warm the bike would hesitate when you applied the throttle, then give one last burst of power just as you closed the throttle, most annoying when trying to merge onto a busy freeway. Remember with this bike, a burst of power actually moves you ahead far enough to put you in a whole different traffic grouping. It was not long before I was exploring the world of full throttle acceleration. I was definitely in my bravest years of motorcycling. First lesson was learned – when shifting to second, back off the throttle before grabbing for the clutch. That is because grabbing the clutch requires you to loosen your grip on the handlebar, and you need all the grip you can get. The CBX could actually go from 0 to 100 kph in first gear without shifting at all, and I'm guessing that would happen in about 4 seconds. In another occasion, I was stopped on the shoulder of a busy freeway. I didn't have much room to get back on the road in the steady stream of high speed traffic, so I did a bit of a rolling start, as I saw a tractor trailer move into the left lane to let me in. I immediately merged onto the slow lane at full throttle. As I launched forward, the back end of the truck never got past the front wheel of the CBX, and a second later, I had left him far behind. Now I understand why people are afraid to give full throttle to a litre bike. I am not as daring anymore myself, and my current bike, twenty years later, has maybe half the horse power, which suits me fine. All the acceleration aside, I was actually able to travel long distances with the CBX. I made three long and memorable trips on the CBX, all three in with Roy, riding a Kawasaki 1300, another six cylinder bike. That bike was even more scary than the CBX, and by that time I had already satisfied my appetite for scary bikes. The first trip was to Quebec province near Baie Comeau. What a place to ride a CBX – where you can actually open the throttle full on a 20 km uphill run with a 12% incline in some places. And feel like you could use a little more power. Not much more, though! Once going up one those hills in the rain, Roy pulled out to pass a car and briefly spun the rear tire. The next year, 1989, another plan – to run down to Key West and back to Canada on the Easter Long Weekend, starting at 1 pm Friday and back home by midnight Monday. That was my longest southern trip to date and introduced me to the idea of long distance interstate travel. I was quite amazed how far we could get in 3 days by staying on the interstate freeway system. In the spring of 1990, Roy and I tried again – a nine day trip to Los Angeles, California and back. This time we didn't stick strictly to the interstates. Part of the fun was trying to find the historic old route 66 on the way. I got the idea of looking for Route 66 by watching the movie “Earth Girls are Easy”, to the tune of “Get Your Kicks on Route 66” by Depeche Mode. In those days, Route 66 was a decommissioned road and almost forgotten, but some loyal fans were already trying to bring it back as a historical route. The CBX club was my first time joining a club dedicated to a type of motorcycle. Actually my previous motorcycles were not the type to inspire owners to band together in clubs for mutual admiration and support. But the CBX was such a motorcycle, partly because of it's flamboyant nature, partly because it had been discontinued by Honda, and owners felt the need to support each other. I have never experienced quite the same level of interest in the BMW Owners club, which I joined a few years later. My first ICOA rally was the North-South Rally organized by Mike Brown, I think it was 1988 at his home in Virginia on the countryside near Gettysburg. If I remember correctly there were exactly 6 bikes at that rally, all CBX's. My next rally, the following year was held in nearby Cambridge, Ontario and about 30 bikes were there. By 1992 my life had changed. I got rid of the Silver Wing and soon after, decided to trade in the CBX on what would be arguably a safer bike – a new 1992 BMW K1200LT with anti-lock brakes. The CBX sat at the Honda dealer for a few weeks, then was put in a container bound for the Netherlands. Looking back on it, all three were great bikes that I wouldn't mind starting over with again.